The Corbett National Park Uttrakhand- the national park with the largest forest cover and a high tiger population is visited every year by thousands of tourists. The park was named after the legendary hunter, conservationist and wildlife author, Jim Corbett. 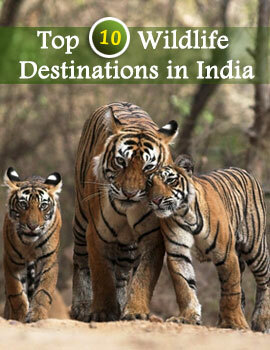 The Corbett National Park offers a large variety of accommodation facilities in the wildlife resorts in Corbett. The Wild Crest offers luxurious stay in a wild setting- like the one you have always fantasized. The 22 spacious Ac cottages at the Wild Crest can be a perfect refuge after a hard day's jungle safari. The tastefully decorated interiors with a view to die for outside the window, can be a home away from home. The restaurant at the Wild Crest serves multi cuisine. Apart from the regular Indian, Chinese and continental stuff you also get a lip smacking variety of local Kumaoni cuisine you must try out. The cozy bar is the right place to shake off your fatigue with the cocktail of your choice. It stocks Indian and foreign liquor.